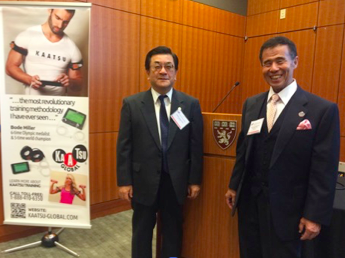 At the Harvard Medical School in Boston on November 5th 2014, cardiologist Toshiaki Nakajima, M.D., Ph.D., formerly of the University of Tokyo Hospital [shown on left with KAATSU inventor Professor Sir Dr. Yoshiaki Sato, M.D., Ph.D.), presented a study entitled Skeletal Muscle Hypertrophy inducted by KAATSU Rehabilitation and Prevention of Sarcopenia. Sarcopenia is the loss of muscle mass and is a major problem among older individuals. Among both males and females, muscle strength decreases with age and muscle volume quickly decreases (0.45 kg per year) as individuals age past 50 years old. That is, fast twitch muscle fiber decreases on average to 50% by the age of 80 years. But with KAATSU, individuals up to the age of 104 [see below and here] can perform low-load or no-load, non-impact exercise with KAATSU equipment following the KAATSU Cycle modality to induce muscle hypertrophy and strengthen muscle even with short-term, low-intensity exercise. 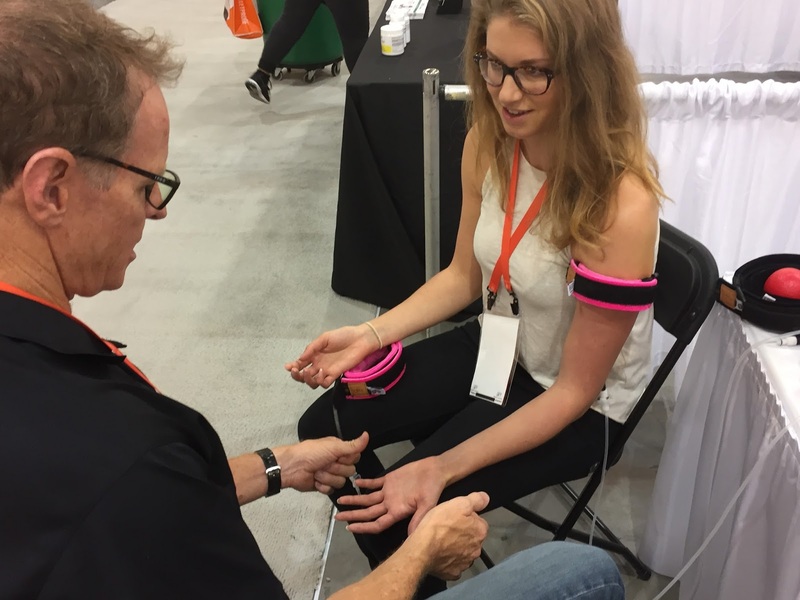 With the KAATSU Air Bands or KAATSU Aqua Bands, the KAATSU no-load, non-impact exercise physiologically equals high-intensity, high-load training. In both cases (KAATSU and high-intensity, high-load training) the muscle and brain are stimulated to induce muscle hypertrophy and strength including fast twitch muscle fibers. Dr. Nakajima tested 19 healthy elderly subjects with a mean age of 71 years [one 84-year-old subject is shown on left]. There were 10 individuals in the control group and 9 individuals in the experimental (KAATSU) group. The individuals did knee extensions and leg press exercises twice per week (Mondays and Thursdays) for 12 weeks. The SKU (Standard KAATSU Unit) pressure on the KAATSU leg bands ranged from 120-250 SKU. He explains the process leading up to muscle hypertrophy due to traditional resistance training. "Typically, an individual needs to perform at least 65% of 1RM to create mechanical stress, metabolic stress, Hormone (cathecholamine) secretion, Growth factor, Cytokin (IL-6), nerve factor, local circulation, hypoxia and cell swelling that leads to adaptation and an increase in protein synthesis and decrease in protein degradation. In contrast, KAATSU leads to several mechanisms that cause KAATSU's hypertrophic effects: recruitment of fast twitch muscle fibers, increase in Growth Hormone and IGF-1 (Insulin Growth Factor), amino acid uptake, increase in protein synthesis and a decrease in myostatin. To view an example of the before-and-after effects of KAATSU on a 104-year-old female, visit here. 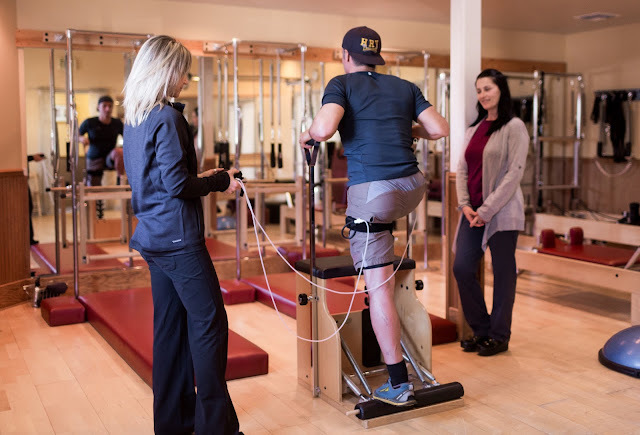 KAATSU Cycle and KAATSU Training is used for a variety of purposes from athletic performance (increasing speed, strength, stamina or size) to rehabilitation to recovery. For many users, the most effective functional movement with KAATSU is walking. That is, simply walking at a comfortable pace with the KAATSU Air Bands on your legs, a most common and popular form of KAATSU performed. Users should start with the KAATSU Cycle and then move right into their KAATSU functional movements of choice. Alternatively, if functional movements are not possible due to age, injury or disability, the KAATSU 3-Point Exercises were developed for these individuals or others who want a specific set of exercises to repeat for their own rehabilitation or training program. Photo shows physical therapist Bettina Bardin-Sorensen PT, MSPT, CAFS, TPI doing KAATSU with a patient. Many athletes and other active people of various ages and backgrounds dislocate their shoulders or tear ligaments and tendons in course of their workouts or competitions. Many of these individuals use the KAATSU Master, KAATSU Master 2.0 or KAATSU Nano products for their rehabilitation and recovery. 1. 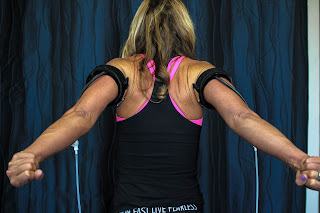 Continue their existing physical therapy, using KAATSU to augment their recovery. That is, if they are doing 60 minutes of physical therapy, continue with the same movements and exercises, but add in KAATSU in the last 20-30 minutes. 2. Do KAATSU Cycle on both their arms and legs, regardless if the injury is in the lower body or upper body. 3. Be well-hydrated before and during KAATSU, and follow all standard KAATSU safety protocols. 4. Start with conservative Optimal pressures on the KAATSU Cycle (e.g., 200 SKU for the first KAATSU Cycle of 3 minutes 20 seconds). Then repeat a series of KAATSU Cycles with higher and higher Optimal pressures (e.g., 250 SKU, 275 SKU, 300 SKU, 325 SKU), always checking for proper Capillary Refill Time. 5. Never move the limb, joint or muscle to the point of pain. Stop just short of discomfort in any movement and move the limb slowly and steadily as the physical therapy movements are being done. 6. The limbs should be fully engorged with blood so the skin becomes a deep pink, beefy red or even a purple color. 7. Never simultaneously put on the arm and leg bands. Work only the upper body with KAATSU and then the lower body. 8. 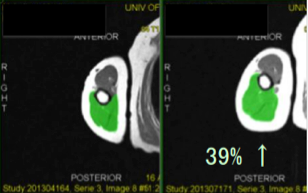 As the body becomes more accustomed to KAATSU, the Optimal SKU pressures will naturally increase. 9. Pay close attention to the appropriate Base SKU levels. It is best to place on the KAATSU Air Bands on snugly so you cannot stick your fingers between the bands and your skin. 10. Email KAATSU Global at info@kaatsu-global.com if you have any specific questions. Photos above show young athletes doing KAATSU Cycles and 77-year-old swimmer Mike Allford of Boston working on his partly torn rotator cuff.